Recently I had a request on YouTube to make a video or blog post about my haircut and since I've changed up the colour slightly I decided to show some photos of the full cut (minus the pitiful little ponytail). My stylist, Sarah O'Brien, at East Vanity Parlour recently added some panels of Special Effects Deep Purple for me. It is the darkest purple EVER! LOL! I've shampooed my hair 5 times in warm water so far and it's still very deep. 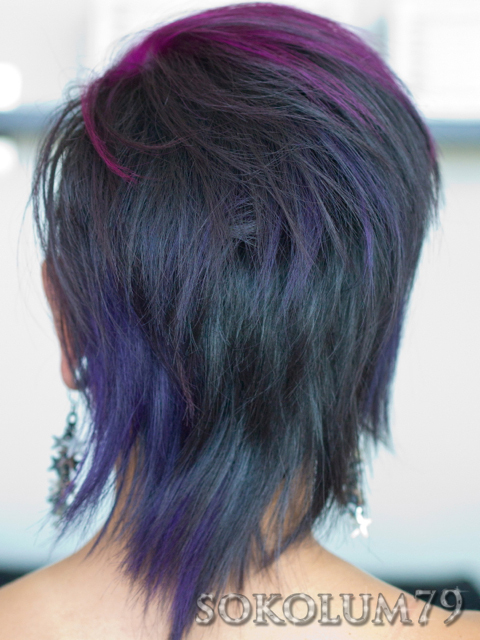 Since it's so subtle, I think next time I go for a root touch up, I'm going to get to her to colour the rest of my hair Deep Purple. It's a beautiful warm purple...and deep, just like the name. Right now it's a shaggy mullet. I'm possibly waiting for the side to grow out long enough to maybe even it out a little more. I have a micro-fringe (as I call it) that goes all the way across my forehead and about 1.5 into my hairline, and a TON of texture cut in. My hair length probably varies from 2" to 6" all over because of all the texture. The magenta colour is still my signature Special Effects Virgin Rose and the dark brown colour is my natural hair colour.